Add a dash of shabby chic flair to your bedroom with the Nelly Onyx bedding collection by C&F Enterprises. A classic rose pattern on a white background creates a look that will withstand the ever-changing trends of today. The quilt reverses to a black and white ticking pattern, to coordinate with the bedskirt and European sham. Add a simple "Sweet Dreams" pillow, and relax in your elegant bedroom. The quilt is 100% cotton and machine washable. Made by C&F Enterprises. Add a touch of shabby chic style to your bedroom with the Nelly Onyx Quilt Set. With a black on white vintage rose print, this stylish bedding creates a timeless look. Reverse to a black and white ticking pattern for additional styling options. Crafted of cotton, this bedding set is machine washable for easy care. 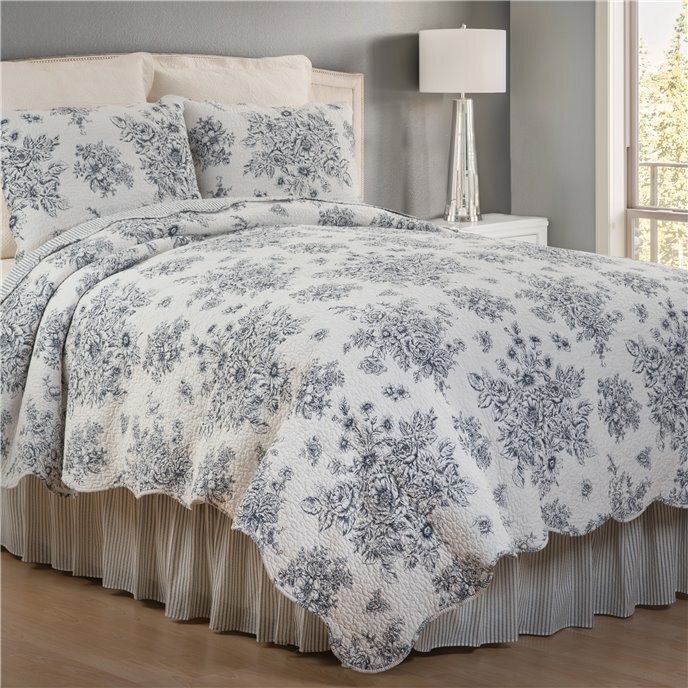 1 Twin Quilt and 1 Standard Sham, Measurements: Quilt 64" x 86"; Sham 20" x 26", Hand Guided Vermicelli Stitching, Coordinating Accent Pillows, Euro Shams and Bed Skirt Available Separately, Cotton, Fill Material Cotton, Machine Wash Cold, Line Dry, Imported. Made by C&F Enterprises. Add a touch of shabby chic style to your bedroom with the Nelly Onyx Quilt Set. With a black on white vintage rose print, this stylish bedding creates a timeless look. Reverse to a black and white ticking pattern for additional styling options. Crafted of cotton, this bedding set is machine washable for easy care. 1 F/Q Quilt and 2 Standard Shams, Measurements: Quilt 90" x 92"; Sham 20" x 26" , Hand Guided Vermicelli Stitching, Coordinating Accent Pillows, Euro Shams and Bed Skirt Available Separately, Cotton, Fill Material Cotton, Machine Wash Cold, Line Dry, Imported. Made by C&F Enterprises. Add a touch of shabby chic style to your bedroom with the Nelly Onyx Quilt Set. With a black on white vintage rose print, this stylish bedding creates a timeless look. Reverse to a black and white ticking pattern for additional styling options. Crafted of cotton, this bedding set is machine washable for easy care. 1 King Quilt and 2 King Shams, Measurements: Quilt 108" x 92"; Sham 20" x 36" , Hand Guided Vermicelli Stitching, Coordinating Accent Pillows, Euro Shams and Bed Skirt Available Separately, Cotton, Fill Material Cotton, Machine Wash Cold, Line Dry, Imported. Made by C&F Enterprises. The classic black and white ticking pattern of the Nelly Onyx euro sham serves as the perfect complement to the Nelly Onyx bedding collection. With a ruffled flange and envelope closure, this Euro sham is versatile enough to add style to any bedding. Crafted of 100-percent cotton this euro sham is machine washable for easy care. Measures 26" x 26", Finished With a Ruffled Flange, Coordinating Quilts, Accent Pillows and Bed Skirt Available Separately, Cotton, Fill Material N/A, Machine Wash Cold, Tumble Dry, Imported. Made by C&F Enterprises. Complete the look of your bed with the Nelly Onyx Bed Skirt. With a black and white ticking pattern, this cotton bed skirt adds classic style to the shabby chic look of the Nelly Onyx bedding collection. Crafted in a 3 sided platform style, this bed skirt is crafted with a cotton drop and polyester platform and is machine washable for easy care. Measures 39" x 76" +18", Split Corners, Coordinating Quilt Set, Accent Pillows and Euro Shams Available Separately, Sides: 100% Cotton; Platform: 100% Polyester, Fill Material N/A, Machine Wash Cold, Tumble Dry Low, Imported. Made by C&F Enterprises. Complete the look of your bed with the Nelly Onyx Bed Skirt. With a black and white ticking pattern, this cotton bed skirt adds classic style to the shabby chic look of the Nelly Onyx bedding collection. Crafted in a 3 sided platform style, this bed skirt is crafted with a cotton drop and polyester platform and is machine washable for easy care. Measures 60" x 80", drop 18", Split Corners, Coordinating Quilt Set, Accent Pillows and Euro Shams Available Separately, Sides: 100% Cotton; Platform: 100% Polyester, Fill Material N/A, Machine Wash Cold, Tumble Dry Low, Imported. Made by C&F Enterprises. Complete the look of your bed with the Nelly Onyx Bed Skirt. With a black and white ticking pattern, this cotton bed skirt adds classic style to the shabby chic look of the Nelly Onyx bedding collection. Crafted in a 3 sided platform style, this bed skirt is crafted with a cotton drop and polyester platform and is machine washable for easy care. Measures 78" x 80", drop 18", Split Corners, Coordinating Quilt Set, Accent Pillows and Euro Shams Available Separately, Sides: 100% Cotton; Platform: 100% Polyester, Fill Material N/A, Machine Wash Cold, Tumble Dry Low, Imported. Made by C&F Enterprises. Drift off to dreamland with the Sweet Dreams Pillow. In a classic black and white colorway with a black piped edge, this embroidered pillow provides an inviting charm to any bedroom. Measures 12" x 24", Contrasting Black Piped Edge, Filled and Finished in USA, 100% Cotton Cover, Fill Material Polyester, Spot Clean, Imported. Made by C&F Enterprises.